There is this vintage show here in LA called A Current Affair that I have heard some amazing things about and haven't yet had a chance to attend. I made that right this weekend and visited it on Saturday night. They had about 25 vintage vendors of the high quality variety and I was impressed by how well curated the selection was. 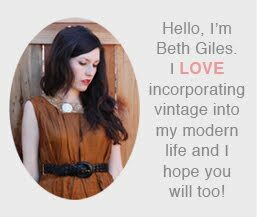 I was also able to connect with some online vintage friends too as an added bonus! My sister, Amy, and I got dressed up in our vintage best and went out to dinner beforehand. It was a great girl's night out! Here's a few pics to share of our outfits. Amy borrowed a dress and necklace from my shop, the necklace can be found here and the dress will be available online soon! Both outfits are lovely, that skirt is gorgeous! Love the little top paired with it too. You both look great in your outfits and I CANNOT BELIEVE THAT'S AMY!!! Time sure flies. I love your things. I keep looking and find things I like. Getting ready for Danielle's wedding in October. I search for things for that, like jewelry and purses. Waiting to get a swatch from my dress to try and color coordinate. We'll see. Say hi to the family for us.